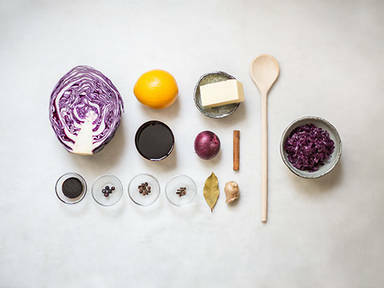 Halve red cabbage, and remove stem with a diagonal cut. Thinly slice cabbage and add to a bowl. Slice red onion. Finely chop garlic. Peel ginger and finely chop. Heat lard or butter in a large pot over medium heat. Add red onion and garlic to pot and sauté until translucent. Add ginger. Place all spice, juniper berries, and cloves in a tea egg. Add red cabbage to pot and season with salt and pepper. Sauté for approx. 5 min. Add bay leaves, orange zest, balsamic vinegar, balsamic cream, and lingonberry jam to the pot, and stir to combine. Deglaze with red wine and add tea egg with aromatics. Cover and let simmer for approx. 30 - 45 min., stirring occasionally. Remove tea egg and enjoy!